To Workshop είναι ανοιχτό σε όλους, δεν είναι απαραίτητη προηγούμενη εμπειρία. Για όσους δεν γνωρίζουν αυτή την παράδοση (ή για όσους θέλουν να τον ξανακούσουν), θα γίνει παρουσίαση και συζήτηση την Παρασκευή το απόγευμα. 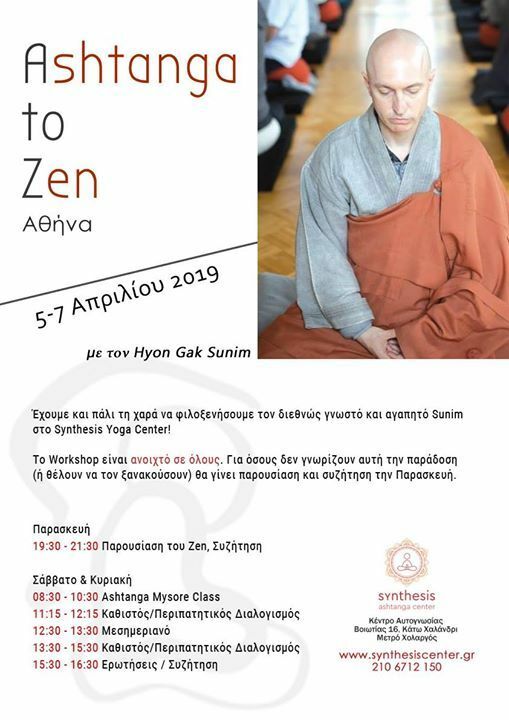 Ο Hyon Gak Sunim έχει διδάξει σε retreat και έχει δώσει διαλέξεις σε πολλές χώρες, τόσο σε μικρές κοινότητες όσο και σε μεγάλα πανεπιστήμια (λίγα λόγια για την εμπειρία του παρακάτω στα Αγγλικά). Έχει έναν άμεσο και καθαρό τρόπο να παρουσιάζει και να μοιράζεται αυτή την απέριττη μέθοδο και είναι πραγματικά μεγάλη τιμή να τον έχουμε κοντά μας. Από τις ιδιαιτερότητες του Sunim είναι ότι είναι και ασκούμενος στην Ashtanga Yoga, οπότε έχει μια οπτική που συνδυάζει βιώματα και από τις δύο παραδόσεις. Στο πλαίσιο του σεμιναρίου θα γίνουν δύο πρωινές πρακτικές το Σάββατο και την Κυριακή πριν το διαλογισμό. Οι θέσεις για αυτά τα μαθήματα είναι περιορισμένες, παρακαλούμε να δηλώσετε συμμετοχή εγκαίρως! Ο διαλογισμός Zen είναι μια τεχνική μέσω της οποίας μπορούμε να ηρεμούμε τον νου και να δίνουμε χώρο για να παρατηρούμε το παρόν με καθαρό βλέμμα. Ενώ έχει ρίζες στο Βουδισμό, δεν σχετίζεται με τη θρησκεία ή άλλη θεϊστική παράδοση. Introduction to Zen Meditation in a weekend of quiet sitting! We are so happy to have Sunim with us at Synthesis once again! The workshop is open to all, no meditation experience is necessary. For those who haven’t met him before (or who would like to hear him again! ), there is a presentation and Q&A on Friday evening. Hyon Gak Sunim (“Sunim”) is a world renowned teacher who has taught and lectured on Zen to small and large communities, including Universities and many other institutions (Please read more about Sunim in the bio included at the end of this description). It is a privilege to have him here, and to experience his clear and straightforward teaching first-hand. Sunim is also a unique teacher in that he is an Ashtanga Yoga practitioner, so he has experienced both traditions and can relate directly to yoga practitioners. Included in the workshop are two morning practices on Saturday and Sunday, before the sitting meditation. Spots for these classes are limited, please book in advance if you’d like to practice! Zen meditation helps us to quiet the mind and open up space so we can see the present moment without the dust of conditioning. Although its roots are Buddhist, it is not a religion, nor does it rely on any form of worship. Hyon Gak Sunim (“Sunim”) was born Paul J. Muenzen in 1964 to a family of devout Roman Catholics in New Jersey, U.S.A. Educated in literature and literary theory at Yale University (BA, 1987) and comparative religions at Harvard Divinity School (Master of Theological Studies, ’92), Sunim was ordained in 1992 in China: He was the first Westerner to be ordained in the People’s Republic of China since the Communist Revolution. He has been doing Zen training in various remote mountain places, including 3 intensive 100-day solo meditation retreats and some forty 3-month intensive meditation retreats (ango) in the ancient Zen temples of South Korea. Sunim received formal public certification of his enlightenment and authorization to teach (inka) from Zen Master Seung Sahn, at a public ceremony in Hwa Gye Sah Temple, Seoul, Korea, in August 2001. He was later appointed by Zen Master Seung Sahn to be the Guiding Teacher of the Seoul International Zen Center at Hwa Gye Sah – his Teacher's 500 year-old home temple in Korea. He served as the Zen Master's personal secretary from 2003 until his death, in 2004. He has compiled and edited several of Zen Master Seung Sahn's books, including The Whole World is a Single Flower, The Compass of Zen, Only Don't Know, and Wanting Enlightenment is a Big Mistake. He also translated into English the 500 year-old classic of Zen Master So Sahn, The Mirror of Zen. The former Buddhist co-Chaplain at Harvard University (1996-97), Sunim has given public talks at Harvard, Yale, Stanford, UC-Berkeley, Oxford, Columbia, NYU, Union Theological Seminary, Brown, SUNY, Université de Paris, University of London, Charles University (Prague), University of Latvia, Vilnius University, and University of Oslo, among many others, in addition to colleges, divinity schools, and countless temples throughout Korea, and other temples in Hong Kong, Singapore, and Japan. He was invited to teach meditation at Facebook HQ in Silicon Valley. Sunim has founded a small temple-community (Zen Center Regensburg e.V) in the Bavarian UNESCO-listed city of Regensburg, Germany, where he leads the traditional 90-day intensive Winter KyolChe, as well as monthly 3-day intensive retreats. He sits on the Advisory Board for OCCURSO, the Institute for Interreligious and Intercultural Dialogue, based at the Ludwig-Maximilian University in Munich, supported by the Roman Catholic Archdiocese of Munich. More on Sunim at www.mirrorofzen.com.